Texas Wedge was first up. 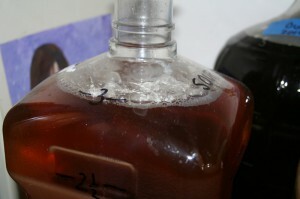 I started the bottles in the dish washer before leaving for the home brew shop, placing the washer on a one-hour cycle. The bottles were ready upon arrival back at the house and brewing fun ensued. 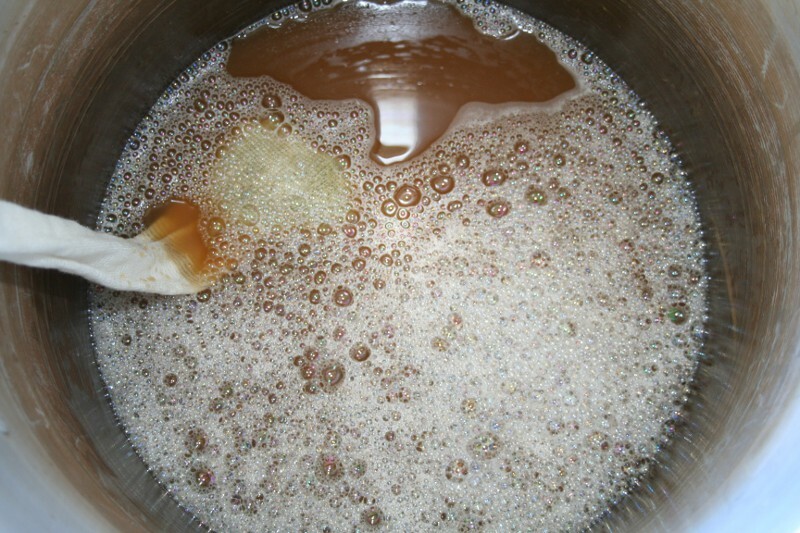 Priming sugar was readied quickly, placed in the bucket, the beer racked on top, and beer flowed from bottling bucket to each bottle in a flash. Clean up of the equipment was next. 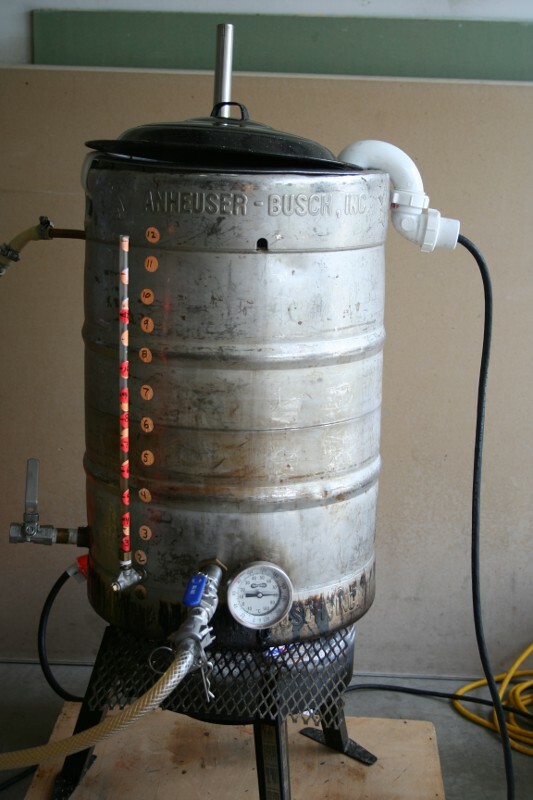 I use separate equipment when dealing with wild yeast and bacteria, just in case. All the equipment used for the bottling process was bacteria sanctioned stuff. Next to ready sanitary water for the IPAs as well as getting hops and carboys. I used HBC 342 and Rakau in these two batches of Duck Hook. Each was racked on top of two ounces of the respective hop originally used. I also had about 16 ounces that I placed on Brett C. I dry hopped that with 0.1 ounces of Citra and 0.4 ounces of a guest hop. These hops have been sitting in the freezer for several months. Don’t know why or for what reason. Needless to say it will be fun tasting that 16 ounces. After a 2.5 mile run in the morning along with the six plus hours of playing brewer, I am glad I decided to wait a day to brew Mango Saison. Enjoy! Useless Fact: The wick of a trick candle has small amounts of magnesium in them. When you light the candle, you are also lighting the magnesium. When someone tries to blow out the flame, the magnesium inside the wick continues to burn and, in just a split second (or two or three), relights the wick. The brew day for Mango Saison has been a long time coming. A little over a month ago, I shared some correspondence I had with Mike Tonsmeire on the topic of a Mango Saison. Since then I have been collecting and freezing Mangos while letting Texas Wedge (rye saison aged on Brett B and C for three months) finish as I wanted to use the Brett from that batch in the upcoming batch. 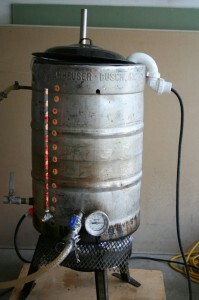 I made a starter 1.5L starter on Thursday with my original aim of brewing Saturday. That wasn’t to be (hopefully another entry soon). I ended up starting with Bears kickoff on Sunday, brewing and watching the anemic Bears’ offense. Glad I had something to keep me occupied. Saturday afternoon, when I bottled the aforementioned Texas Wedge, I added the Brett to the starter. I really don’t know if that was a good idea. I didn’t have a sanitized container for the yeast and I figured the sugars would liven up the Brett. It seemed right, why not. The brew day was lengthened by a 75 minute mash and 90 minute boil. The longer mash is to help convert since Saison’s are usually at the lower end of mash temps (150 is usually about tops) while the longer boil is to help with DMS (think I have that right). More directly: it is what I learned. Saccharification Rest @ 150*F for 75 minutes. The plan is to let this beer ferment out, drop on top of five pounds of mangos, and let the Brett go to work for a while. I will be tasting as I go so I really don’t know how long I will let sit. Better yet, I really don’t know if it will turn out all that great. Possibly Citra and/Amarillo will dry hop the beverage (or at least some) before bottling. Enjoy! Useless Fact:A skunk can spray its stinky scent more than 10 feet. It has been two years since I had a chance to attend the Great Taste of the Midwest. This was a “date” for the wife and I. Perfect. American craft beer festivals in Wisconsin are different in one major way than their Illinois equivalent: no drink tickets. 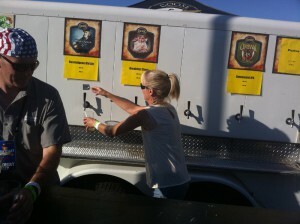 Yep, the beer fests in Cheese head land have no drink limit (or at least the ones I have been to). By comparison, I have never had my fingers wrapped around more than 15 tickets at one time in Illinois. I would say the most surprising beer of the day was O’so Hop Whoopin. Nice resinous and tropical fruit hop mix that was easy to drink. I had three heaping helpings. A half glass pour of Breakfast Stout reassured me that it was my favorite beer of the day. Vintage Hibiscus Saison was probably Sue’s favorite, which means I might be trying to brew something similar. 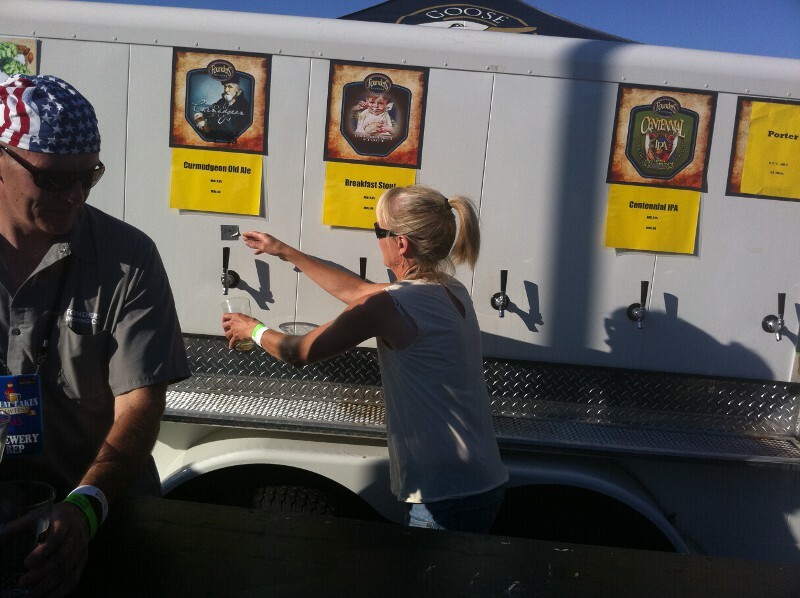 Some breweries were already out of beer by 5:15PM, barely more than two hours after the fest began. This was a hang up for Sue. We were in line for Bourbon County Stout when the keg ran dry and the crowd dispersed. Overall I was happy with the beers I tried but don’t think we will be back for a while. The wife mentioned she prefers the American craft beer at FOWBAB much more: rare, short release, and big. Enjoy! Useless Fact: The Sun burns 600 million tons of Hydrogen every second. Baby Shower = Dark Lord!?!? 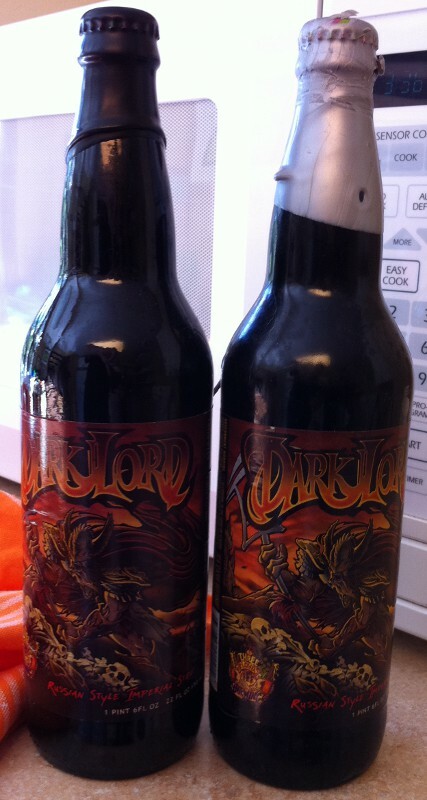 How does Three Floyds Brewing Company Dark Lord and a baby shower come about? Easily when Chuck is the soon to be first time father. He has been planning the shower from the standpoint of beer for a long time (uncanny how differently men and women look at a baby shower). Fuggli – A Belgian style beer made with all Fuggles hops. Light. Pink (I think as he is having a daughter) – A light beer that was infused with hibiscus, to give it a pink color, and aged on oak. My favorite out of the group. I knew Chuck had a plan to bring some older Dark Lord bottles to share with the worthy. Glad I am worthy. He opened up a bottle of 2007 and 2008 Dark Lord. His friend Michael and I were responsible for splitting a bomber equally between ten pours of each: the worthy were to get 2 ounces of joy from each bottle. Luckily the plastic cups had a line that I determined to be the 2 ounce marker; amazingly it was. 2007 had a charred flavor that over whelmed, distracting from the experience. I would say it is past its’ prime. 2008 was much smoother, not having really much character compared to the first. It was hard to go back and forth without cleansing the palate. I might also just be that bad of a taster. Both beers still had hints of alcohol while leaving the lip sticky. Not quite cloying but awfully close. I would like to try them both again in a more controlled environment. I imagine that 2009 has to be drinking well at this time. I did bring chuck a bottle of Bourbon County Bramble Rye as my baby shower gift (Yes, my wife did get real baby shower gifts). Once the baby comes, I have a special treat to open on a Thursday night when Chuck can make it out. Enjoy! Useless Fact:Starch is used as a binder in the production of paper. It is the use of a starch coating that controls ink penetration when printing. Cheaper papers do not use as much starch, and this is why your elbows get black when you are leaning over your morning paper. Posted in Beer, Lounge | Comments Off on Baby Shower = Dark Lord!?!? You are currently browsing the Sips blog archives for September, 2012.